If I hadn't already known where to find Bittersweet Farms, I may never have even come upon it. Located on Westport's Main Road, Bittersweet Farms Restaurant and Tavern is tucked away at the quiet end of a busy area. Mom has read about the restaurant several times in The Herald News, but had informed me of their rather high prices. 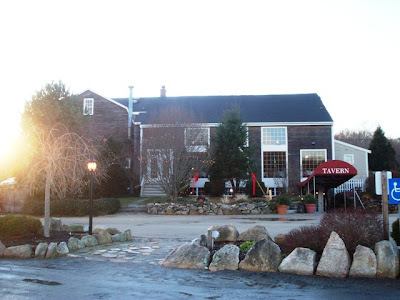 The tavern, however, was recommended by Liz, one of our greatest fans. She raved about their delicious food and great prices, so Mom and I decided to see for ourselves what Bittersweet Farms was all about. We arrived at Bittersweet at just about 3:15 p.m.
We pulled into the large parking area and immediately spotted a sign that pointed towards the tavern. A second arrow leading to the restaurant pointed up a flight of stairs. 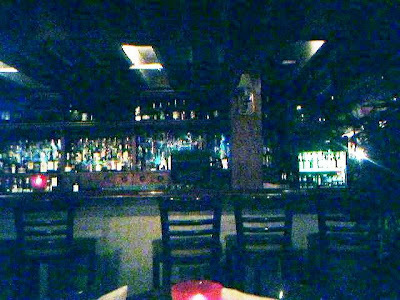 After taking some outside shots of the building, which is beautiful, Mom and I headed down the ramp and into the depths of the tavern. A nearby waitress/hostess told us to seat ourselves, and so we did. We chose a table that faced into the dining room, across from a large fireplace. While Mom was taking off her jacket, I noticed someone walking over to our table. I brushed it off at first, but was very surprised when I heard this person say, "Is your name Laura?" Lo and behold, it was Liz! The very reason why Mom and I were dining at the Bittersweet Farms Tavern. We had never met in person before, but had chatted several times via the New England Bites MySpace page. After introductions were exchanged, Liz dashed off to her table to rejoin her husband, Dave. 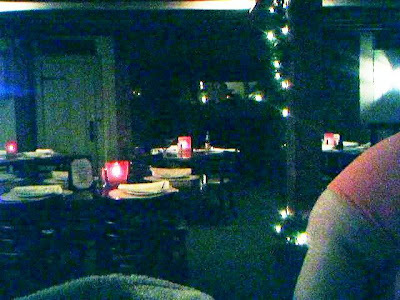 Seconds later, we were joined by Erin D., our waitress. Dressed in uniform, she promptly took our drink order - two Diet Pepsis. Before retrieving the drinks, she left Mom and I with two thick, pleather-bound menus. After returning with our drinks, which came in two barrel-shaped glasses, Mom and I asked Erin to give us another minute to decide on an entree. The descriptions of everything sounded quite delicious, and Liz even mentioned that the pulled pork was really good. Since I am very easily influenced, when Erin came back to take our order, I chose the pulled pork sandwich ($9), which is served with cornbread, cole slaw, fries, and a fried pickle. 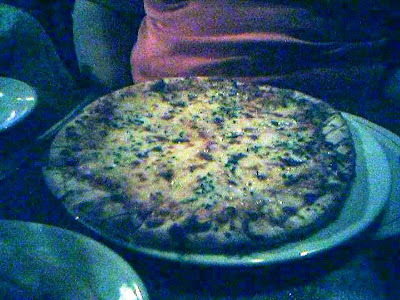 Mom decided to go with the tomato and cheese pizza ($9), which is a Don Pepino classic according to the menu. Erin took away our menus as Mom and I checked out the interior. This place is dark! It was so dark in here that the pictures aren't all that great. I could have used the flash on my camera, but a nosey customer to my left apparently couldn't take her eyes off me, and I didn't want to give her something else to stare at by busting out my digital camera. I had to rely on my cell phone to photograph the place. It was very pub-like and extremely cozy. The large wooden bar had a great shine to it and was decorated with various bottles and jugs. Wooden beams were visible overhead, and the lights from the remaining Christmas garland bounced off the painted grey walls. High wooden stools accompanied the bar, while the dining room was set up with wooden tables and chairs. A large flat screen TV faced our table and was turned to a sports channel so that patrons could see if the Patriots were going to win their 16th game in a row this season (and they did). The large fireplace, which Liz and Dave were sitting in front of, was turned off, but beautiful nonetheless. The only flames that were visible were coming from the small, red candle holders sitting atop each table. Aside from the footsteps coming from the upstairs restaurant (we were seated near a long set of stairs), Bittersweet Tavern is a very clean and mellow place to hang. We hadn't been waiting long before our bread basket arrived. Liz had mentioned that we were going to be getting a lot of "bread and love," but I had no idea that we were going to get something so delicious! 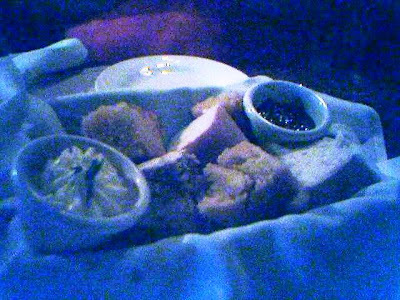 There were several different types of breads in the basket, along with side dishes of chili sauce and butter. The two slices of rye, cornbread, and a type of country white did not last long at our table. The bread was very fresh and the presentation was fantastic. We were very impressed, and we hadn't even gotten to the meal yet! I like the fact that you can still get Bittersweet food without paying the restaurant prices. The tavern menu was fairly large, and included a lot of different meal options. Appetizers included mussels marinara ($8), steamed littlenecks and chourico ($11), and the Bittersweet wings (bone-in $7/tenders $8), which come in buffalo, barbecue, honey mustard, or Jamaican jerk flavors. Salads include the classic grilled chicken ($8), the portobello mushroom salad ($9.50), and the teriyaki glazed steak tips salad ($12), which is served over mixed field greens with an oriental honey ginger dressing. Surprisingly enough, Bittersweet Tavern has a raw bar! Raw food includes chilled jumbo shrimp ($2.75 each), oysters on the half shell ($1.85 each), and chilled ocean treasures, which includes six clams, six oysters, and four chilled jumbo shrimp ($23.50). Add a chilled, cracked lobster for another $9.50. The sandwich board states that all sandwiches are served with fries, cole slaw, or a demi salad. Choices include the lump crab cake club ($9.50), fried roast beef sandwich ($11.50), and the Bourbon Street "Barnsider" ($10.50), an open-faced six ounce grilled prime rib on Texas toast topped with bourbon-glazed onions and melted Swiss cheese. A large list of comfort foods includes favorites like the shepard's pie ($9), baked chicken pie ($9.50), and the Gourmet Bistro ($15), which is an eight ounce flat iron steak with fries and slaw. Add a hearty lump crab cake for another $6. Their pizza list starts with the tomato and cheese pizza ($9), with $1 for every added topping. Listed as a specialty pizza is the seafood pesto ($11.50), which includes grilled shrimp and scallops in a pesto cream sauce. Along with Bittersweet's large list of alcoholic drinks and frozen margaritas, there is also a large list of desserts. Liz recommends the Bittersweet Kiss ($7.50), which is a house specialty. This dessert consists of a warm brownie tart with chocolate ganache over a layer of raspberry coulis and white chocolate sauce, topped with vanilla bean ice cream. Sounds good, right? There is also bread pudding ($5), creme brulee ($6), and an Italian almond cream torte ($5.50), just to name a few. Also on the menu are the Bittersweet Farms specialty coffees and cappuccinos. After Liz and Dave had finished eating their delicious looking desserts, they came over to our table to say their goodbyes and chat about - what else - yummy food. When Liz spotted Erin bringing over our entrees, she wished us well and left us to eat. Both dishes really looked and smelled amazing, however, after a few bites Mom asked me to take a slice of her pizza and try it for myself. After I took a few bites, we both agreed that the crust definitely tasted frozen (think Ellio's). Not that there's anything wrong with this, but we were quite surprised that Bittersweet did not use fresh dough. Maybe it is too much trouble to make the crust on the premises, but it would have been nice. The sauce and cheese were good, but not remarkable. Add that to the texture of the crust and you'll get a pizza that was a little disappointing. If we had to sum it up, it tasted like a good frozen pizza. My pulled pork sandwich was very tasty. The bun was soft, and the juicy pork was mixed in with fresh veggies. Be warned - this is not a barbecued pulled pork sandwich. Although I was expecting that barbecue flavor, it was never advertised as so. I guess I am just used to always having that little kick when I'm having a pulled pork meal. The sandwich was, however, very tasty and I am glad that I got to try it. The fried pickle was delicious! The fried coating kept the pickle hot, which surprised me when I took the first bite. 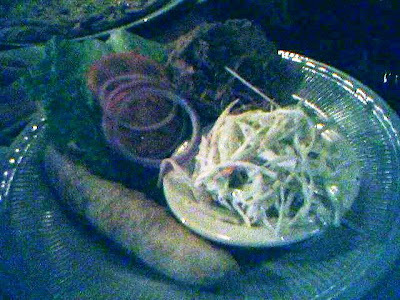 The cole slaw and fries were also very good, and I was glad to see that this sandwich plate came with a lot of extras. I gave Mom a piece of my sandwich, and she thought it was very good, but was missing that barbecue taste. TOTAL = $21.90 ... or was it??? It seems that a certain "restaurant angel" had decided to use some of her own money toward our bill, which brought it down quite a lot. Hmm ... I wonder who that was ... :) Whoever it was (wink, wink) totally made our day. We left the bill and a 20% tip for Erin on the table, and inquired about getting a take-out menu. She told us that Bittersweet had been overloaded with gift card requests for the holidays and did not have any left to give out. 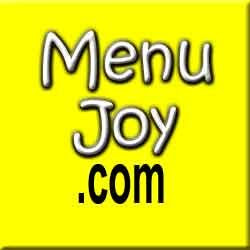 Thankfully, the full menu is available on the Internet. Erin also brought over two chocolate-covered mint sticks for Mom and I to cleanse our palate. Yummy! One day, when we hit the lottery, Mom and I will be brave and try the Bittersweet Farms Restaurant. For now, we'll just concentrate on trying more things at the tavern. It is definitely the kind of place you could take a date - or your mother - and Mom and I look forward to having lunch here again. Once again, Liz didn't let us down!